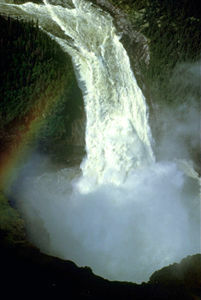 Bloody Falls are rapids located about 15 km above the mouth of the Coppermine River in the central Arctic. 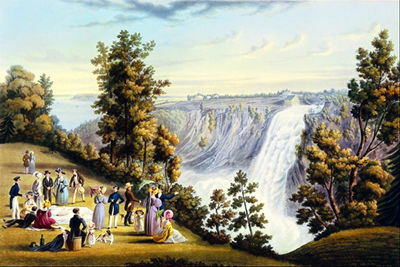 Chute Montmorency, located 13 km east of Québec City at the mouth of Rivière Montmorency where it empties into the St Lawrence River, is the highest waterfall in the province of Québec and the eighth-highest in Canada. 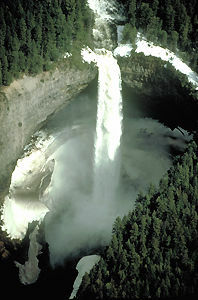 Della Falls is Canada's highest Waterfall. 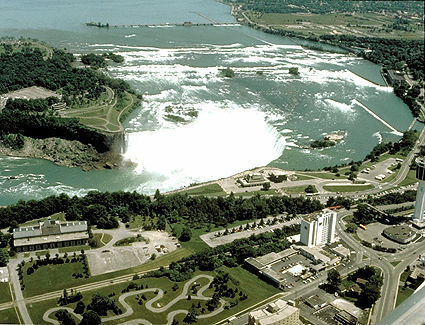 The falls have eroded the soft shales and limestones of the escarpment at an average rate of 1.2 m per year and now stand 11 km from their place of origin at present-day QUEENSTON. Their recession rate has been variable though, as the volume of water flowing from the upper Great Lakes controls it. Takakkaw Falls, situated just west of the Continental Divide in Yoho National Park, is Canada's second highest waterfall.